The complete fixation test (CFT) is used to detect the presence of specific antibodies in the patient’s serum. This test is based on the use of complement, a Biologically labile serum factor that causes the immune cytolysis i.e. lysis of antibody coated cells. It is the nature of the complement to be activated when there is formation of antigen-antibody complex. The first step is to heat the serum at 56°C to destroy patient’s complement. A measured amount of complement and antigen are then added to the serum. If there is presence of antibody in the serum, the complement is fixed due to the formation of Ag-Ab complex. If no antibody is present then the complement remains free. 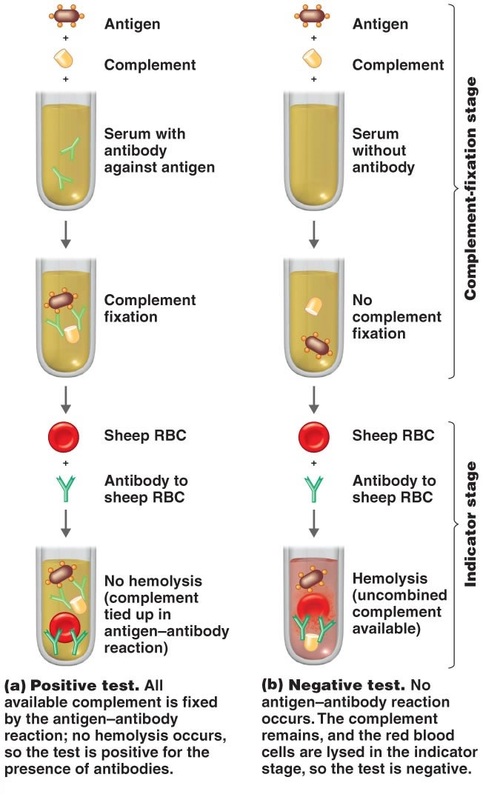 To determine whether the complement has been fixed, sheep RBCs and antibodies against sheep RBCs are added. In the positive test : The available complement is fixed by Ag-Ab complex and no hemolysis of sheep RBCs occurs. So the test is positive for presence of antibodies. In the negative test : No Ag-Ab reaction occurs and the complement is free. This free complement binds to the complex of sheep RBC and it’s antibody to cause hemolysis, causing the development of pink color. The following figure shows the steps involved in the procedure of complement fixation test. Positive test : The available complement is fixed by Ag-Ab complex and no hemolysis of sheep RBCs occurs. So the test is positive for presence of antibodies. Negative test : No Ag-Ab reaction occurs and the complement is free. This free complement binds to the complex of sheep RBC and it’s antibody to cause hemolysis, causing the development of pink color. wow thanks, helps a lot!